Professor Keblinski received his Ph.D. from the Pennsylvania State University in 1995. Before he joined Rensselaer in 1999 he was a postdoctoral researcher at Argonne National Laboratory and worked at Forschungszentrum Karlsruhe in Germany as a recipient of an Alexander von Humboldt Fellowship. Professor Keblinski is an author or co-author of 129 papers on topics ranging from mesoscopic-level modeling of vapor deposition and phase separation to atomic-level structure and properties of interfaces in metals, covalent materials and ionic ceramics. Professor Keblinski’s work is focused on the relationship between microstructure and various materials properties, such as mechanical response, diffusion, interfacial migration and phase diagram, in particular, of nano-structured materials. 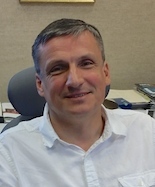 A major goal of Professor Keblinski’s work is to design and analyze computational models in order to gain insights into the nature of the material behavior and properties. These insights are than used to formulate theoretical concepts, to understand experimental results and to guide future experiments. Other interests include connecting atomic-level modeling with electronic-level studies as well as with the macroscopic description of the material based on constitutive models.